Take a break from the glitz and gambling of the Las Vegas Strip for some old-fashioned fun at the happiest place on earth! 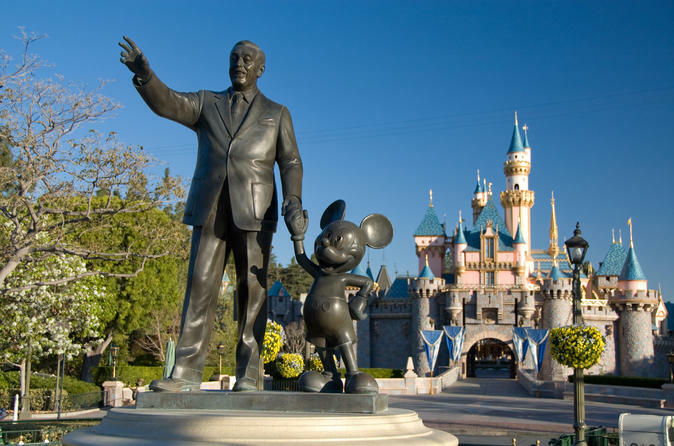 Travel to Anaheim, California, by luxury motor coach for a 2 or 3-night vacation package to both Disneyland and California Adventure theme parks, where you can relive childhood memories or make some new ones. Hop aboard a luxury motor coach, settle in and relax for the 4.5-hour drive from Las Vegas to Anaheim. When you arrive in Anaheim and before retiring to your hotel, spend the evening visiting the Downtown Disney District, a lively area that features shopping, dining, and nighttime entertainment. The Downtown Disney District is located just outside the parks and offers something for everyone from early morning until late at night. The next morning, get ready for a day of fun and excitement at two Disney theme parks. Your Anaheim vacation package gives you access to both Disneyland and California Adventure. At Disneyland, Walt Disney’s original theme park, experience the thrill of favorite rides like Space Mountain, Pirates of the Caribbean and the spinning tea cups.Shake hands with Mickey Mouse, wander through Tomorrowland, and make memories while you enjoy Disneyland’s timeless fun and imagination. Adjacent to Disneyland is California Adventure, making it easy to hop back and forth between the two parks! At California Adventure you’ll delight in areas themed after California’s signature attractions, from classic, boardwalk-inspired rollercoasters such as California Screamin’ to the screamingly funny Muppet Vision 3D show. From the Bay Area to Hollywood, California Adventure takes you on a journey across the Golden State’s most remarkable icons. You’ll spend the night in Anaheim and then return to Las Vegas via motor coach the next morning. Upgrade to the 3-night package for an additional day at the Disneyland Resort theme parks!